EXTRA | What Does EXTRA Mean? EXTRA means "Extremely Over The Top". The term EXTRA is typically used to describe a person who behaves in an excessively dramatic way. Though EXTRA has been around since the early 2000s, it only became really popular around 2015. 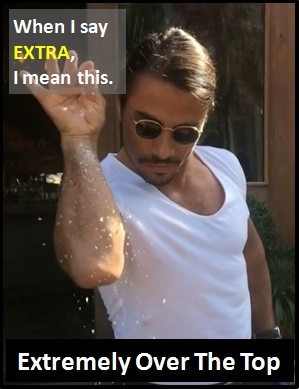 One of the most famous examples of EXTRA is the Turkish Chef "Salt Bae" who became a meme and gained popularity for his Extremely Over The Top salt sprinkling in online videos. "Salt Bae" is very EXTRA. Person A: We're only going to get some milk. Why does she have all that makeup on? Person B: She's so EXTRA! Person A: Her reaction was so EXTRA when she heard the news. Person B: She's always been a drama queen. Before the digital era, we would have said something like "Drama queeen" instead of using EXTRA.